A few years ago the concept of "six degrees of separation"* was coined, the idea being that everyone in the world could be connected to everyone else by no more than six degrees. 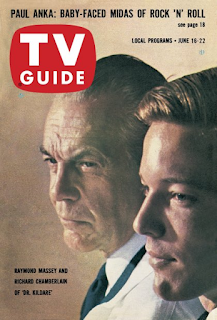 The same could be said, I suppose, for articles in TV Guide. To test this theory, let's take a look at this week's issue, and see if we can bring it all the way from 1962 to today in six steps or less. *Or "Six Degrees of Kevin Bacon," if you prefer. 1. Right doctor, wrong role: Westinghouse Presents was an occasional series of dramas sponsored by the electronics giant, previous sponsor of Studio One. On Wednesday evening Westinghouse Presents features Margaret Leighton in "The First Day," the story of a woman returning to her former life after having been hospitalized for a nervous breakdown. Leighton's husband in the play is played by Ralph Bellamy, who the next year would star as Dr. Richard Starke in NBC's psychiatric drama The Eleventh Hour. I would presume that everything turns out all right for Leighton but, if not, perhaps she could make an appointment with Dr. Starke. *The Eleventh Hour ran for only two seasons, but was still more successful than ABC's similar drama Breaking Point, which itself was a spin-off from the Kildare clone Ben Casey. 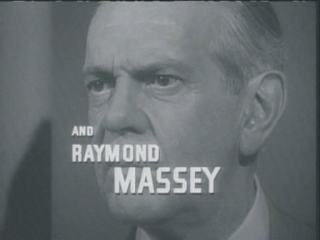 *Who, as far as I could tell, never wrote a work adapted into a movie in which Massey appeared. Massey was a dignified actor - sadly, not too many of those around anymore. 3. Since you mentioned it: In addition to his several portrayals of Lincoln, Raymond Massey also played the abolitionist John Brown in a pair of movies - Santa Fe Trail and Seven Angry Men - and onstage in a dramatic reading of Stephen Vincent Benét's Pulitizer Prize-winning poem John Brown's Body. And it's that very story - John Brown's Body that CBS has on Thursday night at 7:30, preempting the police drama Brenner. This one doesn't have Massey, but it does feature Richard Boone as the Narrator, with Douglas Campbell as John Brown. In a couple of seasons, Boone will star on NBC in The Richard Boone Show, an anthology series with a rotating repertory cast. Despite critical praise, it will only run one season before being canceled, replaced by The Man From U.N.C.L.E. Boone finds out about it not from the network, but from the trade papers. 4. Her stock is rising: Actress Diana Millay, as it happens, appeared in both The Man from U.N.C.L.E. and The Eleventh Hour. But that is in the future - today, in addition to being one of the hardest-working actresses in New York (nearly 100 live shows to her credit), the 23-year-old is also making her mark as a day trader in the stock market. While most actresses are concerned with their reviews, Millay can be seen pouring over Forbes and The Wall Street Journal between takes. Later she'll find more success in commercial real estate and fine art. This article is typical of so many that have run in TV Guide over the years, and you might wonder if anything ever happened with Millay or if she faded to obscurity like many a starlet from previous profiles. But in this case, Diana Millay did all right for herself, assuring lasting fame as Laura Collins in Dark Shadows. No word on how much of a killing she made in the market. 5. Did someone say "young star"? 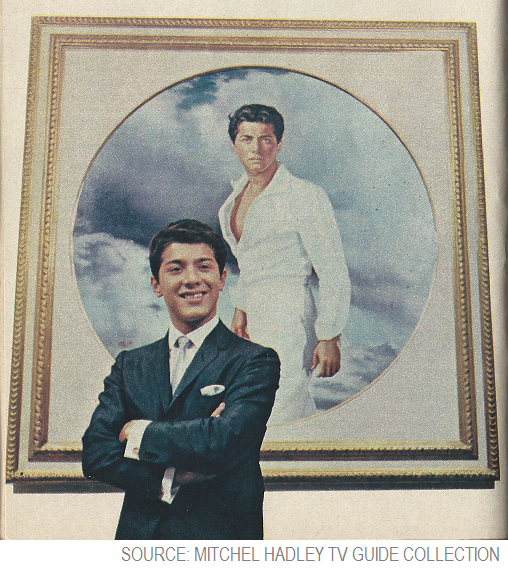 Any discussion of talented young performers has to include Paul Anka. At the time of this writing Anka is still 20 - three years younger than Diana Millay, but in that time he's accomplished - well, let the statistics speak for themselves. At 15 he signed a contract with Don Costa at ABC/Paramount, and had his first hit: "Diana," which sold 8,500,000 copies. He followed that up with "Lonely Boy" and "Puppy Love," each of which were million-sellers. He's appeared as an actor in movies, most recently in the war drama The Longest Day, for which he also wrote the theme. According to the famed musical writing team of Comden and Green, "it is not too early to mention Paul Anka in the same breath with musical immortals." He's accessible, appearing constantly on variety shows: Sullivan, Como, Shore. He's a mean Password player. He makes well over a million dollars a year. And he isn't even old enough to vote or drink. The unbylined article portrays Anka as a driven businessman. He has little time for personal relationships, other than those that are part of the business. He has little time for girls, even though the broken romance is a staple of his songs. He's insecure - "I care about being liked. I want everybody to like me," he tells his interviewer. He's angered by those who resent his early success, and those who ridicule rock music in general. What's particularly interesting about this article is that although Anka is already established as a major star in records, television and movies, his biggest hits are still ahead of him: "My Way," the Sinatra hit for which he wrote the English lyrics; "She's a Lady," the Tom Jones hit, and "Johnny's Theme," the Johnny in question being Johnny Carson. And the guy's still only 71 - not bad, huh? 6. What's old is new again: Paul Anka was payed a royalty every time the theme for The Tonight Show was played - over 1,400,000 times by one estimate. Every night Johnny's monologue began with that theme, and ended with Johnny's golf swing. And that brings us to the present day, and the highlight of the sporting week. 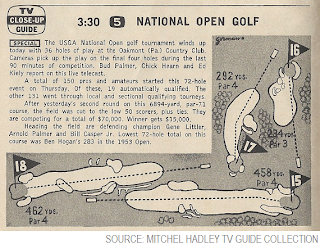 The U.S. Open golf championship, or the National Open as it was frequently called back in the day, is - then as now - this weekend's Big Event. Then, as now, it's being shown on NBC; then, as now, it's being played in Pennsylvania, but whereas this year's tournament is at Merion, just outside Philadelphia, in 1962 its across the state, at Oakmont, outside of Pittsburgh. There's another difference in 1962: the tournament is scheduled for three days, concluding on "Open Saturday" with a 36-hole marathon. Golf's reigning superstar, Arnold Palmer, is the hometown hero (from nearby Latrobe), and having shared the lead after the second and third rounds, everything seems to point to his second Open championship. However, at the end of 72 holes Palmer finds himself tied with a rising star: the 22-year-old Jack Nicklaus, who had been the low amateur at the last two Opens. The two meet in a playoff on Sunday, in front of a raucously pro-Palmer crowd. Jack leads Arnold by four shots after six holes and goes on to a three-shot victory. It's the start of the Nicklaus dynasty: his first professional win, and the first of his 18 major professional championships. Palmer, who had won the Masters earlier in the year and will add the British Open in July, takes his third Masters in 1964, but after that never wins another major title. And there you have it: from Margaret Leighton in "The First Day" to the U.S. Open in the present day, all in six steps. Not bad, hmm? Notes from the Teletype and more: In the works for the coming season: The Patty Duke Show, Lee Marvin's Lawbreakers, and Mr. Magoo's Christmas Carol. All of them made it to the small screen, and all of them are available on DVD. . . Future Oscar winner Marvin stars this week in The Richest Man in Bogota, based on the sci-fi story by H.G. Wells . . . NBC announces that 68% of its prime-time programs for 62-63 will be in color, compared with 57% this season and 41% a year ago. NBC remains the dominant player in the color television market . . .I wrote about the TV Guide Awards here; the 1962 version will air next week, headlined by Judy Holliday, Art Carney and Dave Garroway. . .Premiering this week on CBS daytime: To Tell The Truth, which adds the daytime component to its long-running nighttime run, now in its sixth season. The prime-time version will run until 1967, daytime ends a year later. Longtime soap The Secret Storm expands from 15 minutes to a half-hour, leaving only The Guiding Light and Search For Tomorrow in the old radio-era length. Both will finally go to 30 minutes in 1968, bumping - To Tell The Truth. By the way, if you really do want to play this game with Kevin Bacon, then step 6 is as follows: Paul Anka was in Mad Dog Time with Diane Lane, who was in My Dog Skip with Kevin Bacon. See how easy?